My oil infusion has finally come to an end. I know, I know you all are doing a little happy dance and saying fiiiiinnnaaalllly! Yup this is it, no more oil infusion frenzy. 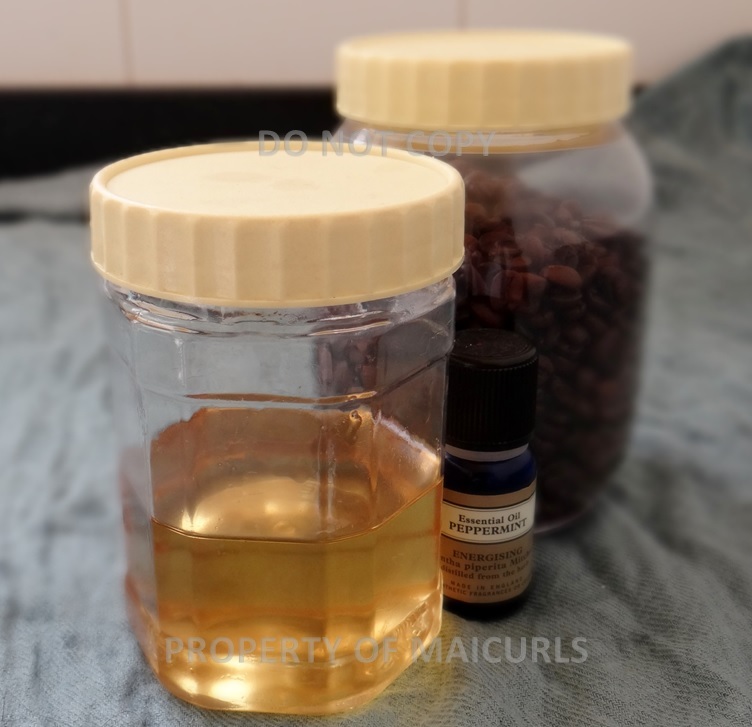 As you probably guessed (thanks to the title and picture) the oil I will be sharing is my DIY Coffee Bean Infused Almond Oil! 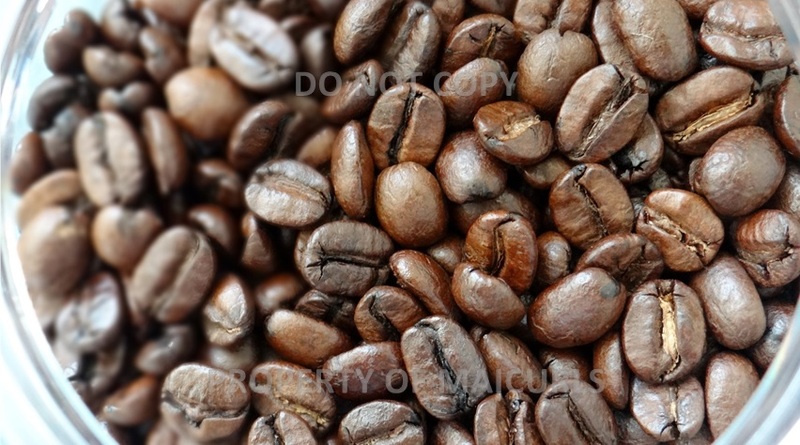 Doesn’t the coffee beans look oh sooooo good?! Right, first off I need to stress how much I LOVE this oil!!! Of all the 6 in fusions I have done this is right up there along with my DIY Rose Infused Grapeseed Oil. As with most of my infused oils you can use this one for both your skin (face/body and scalp) as well as your hair. The caffeine helps reduce puffy and dark circles under the eye. Tightens the skin giving you a youthful fresh glow. 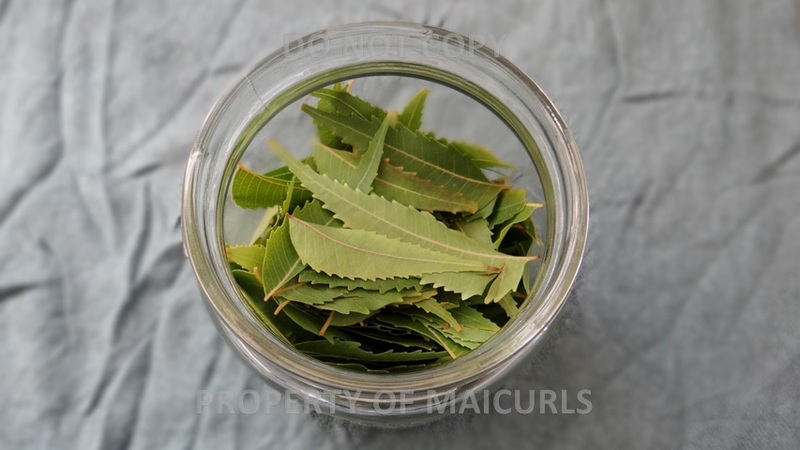 Its anti-inflammatory properties is said to reduces redness in the skin and inflammation. Said to reduce the appearance of cellulite. Known to help reduce the appearance of fine lines and wrinkles on the face. Fights free radicals thanks to the antioxidants contained in caffeine. If you try this please let me know how it turns out. If you make your own Infused Coffee Oil I would love to hear from you! This entry was posted in Almond Oil for hair, Almond Oil for skin, Coffee infused oil, DIY Coffee infused oil, DIY Infused Oil for hair, DIY Infused Oil for Skin, DIY Infused Oils, Infused Coffee oil for hair, Infused Coffee oil for skin and tagged Almond Oil for Skin, Alomnd oil for skin, Coffee bean infused oil, Coffee infused oil, Coffee infused oil for skin, DIY coffee bean infused oil, DIY Coffee infused almond oil, DIY coffee infused oil, DIY Infused oil, DIY Infused oil for hair, DIY Infused Oil for Skin on November 27, 2014 by Maicurls. Note – If you have light hair e.g. blond to light brown, the oil can darken your hair. Hibiscus oil is slightly acidic. Due to the fact hibiscus can stain, you might want to cover your workspace and wear clothes you don’t mind getting stained when making the oil. Depending on the carrier oil you choose, you also get the additional benefit of that along with the properties of hibiscus. On my blog I have a list of different carrier oil benefits for the hair and skin. Almond oil is rich in Vitamin A, B and E which is excellent for the hair and scalp. It is easily absorbed into the skin as well as the hair and therefore does not weigh down the hair nor clog up our pores. It is known to help sooth irritated scalp, reduce dandruff due to its moisturizing properties and gives the hair a natural sheen. It can be used as a conditioning agent, smooths the hair’s cuticle, reduces hair shedding and promotes growth. If you try this please let me know how it turns out. 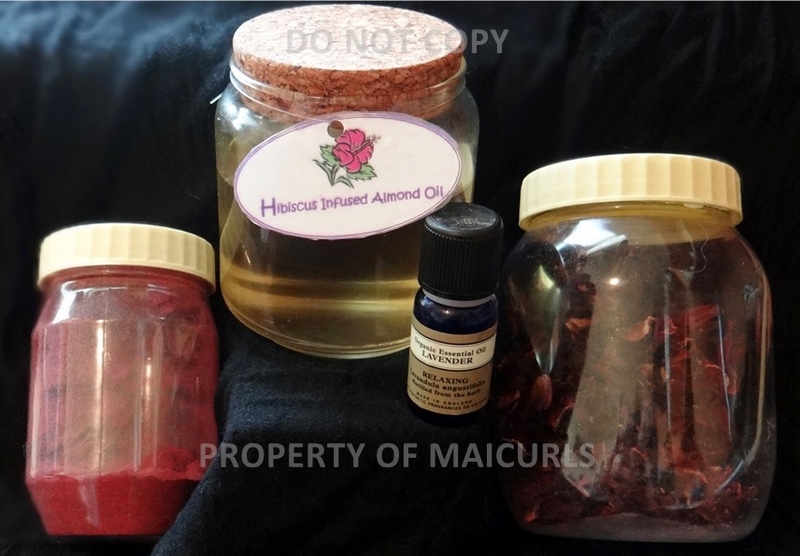 If you make your own Infused Hibiscus Oil I would love to hear from you! 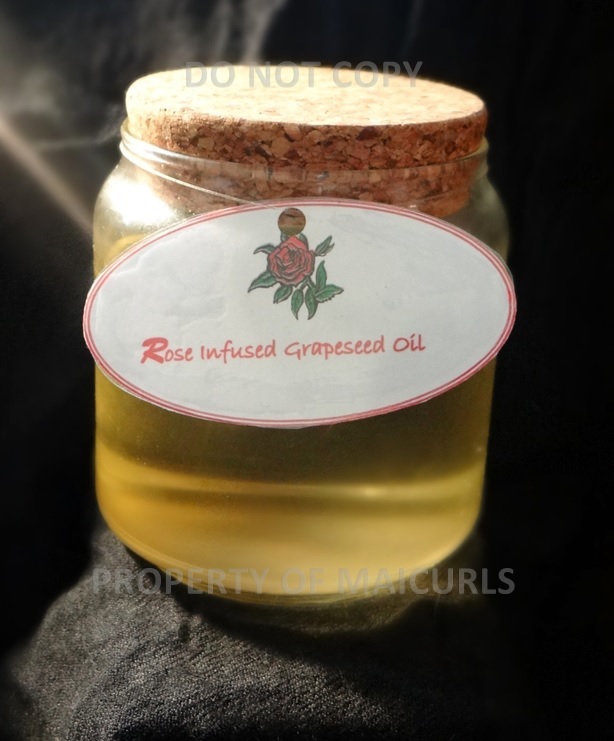 P.S if you missed my Rose Infused Grapeseed Oil check it out here. This entry was posted in DIY Infused Oil for hair, DIY Infused Oils, Infused Hibiscus oil for hair and tagged Darkening hair with hibiscus, Darkening hair with natural oil, DIY Hibiscus Infused Almond Oil, DIY Hibiscus Infused Oil, DIY Hibiscus Infused Oil for Hair, DIY Hibiscus Infused Oil for Scalp, DIY Infused oil for hair, DIY Infused Oil for Scalp, DIY Rose Infused Grapeseed Oil, DIY Rose Infused Oil, DIY Rose Infused Oil for Hair, DIY Rose Infused Oil for Skin, Hibiscus Infused Oil, Hibiscus Oil, Naturally darkening hair on September 24, 2014 by Maicurls. I mentioned in my last post (here) that I am going to making a “mini series” of DIY Infused oils and here is the first. 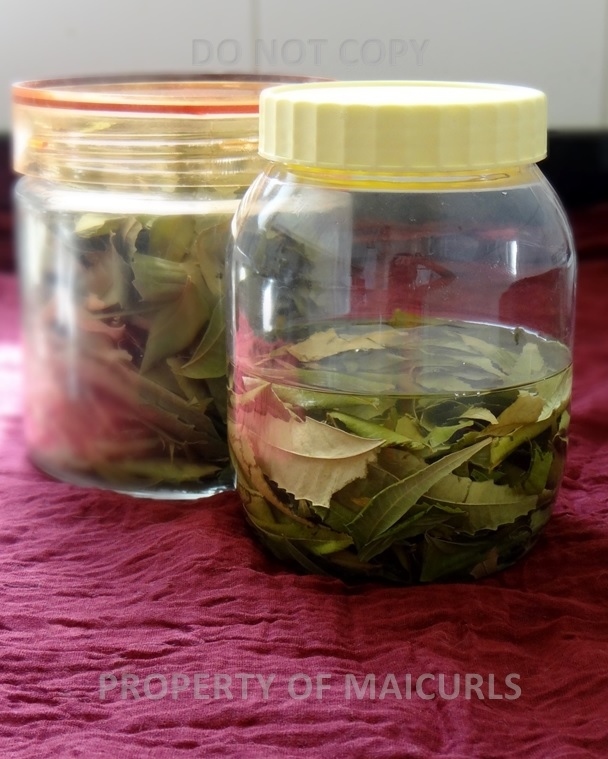 My DIY Rose Infused Grapeseed oil. 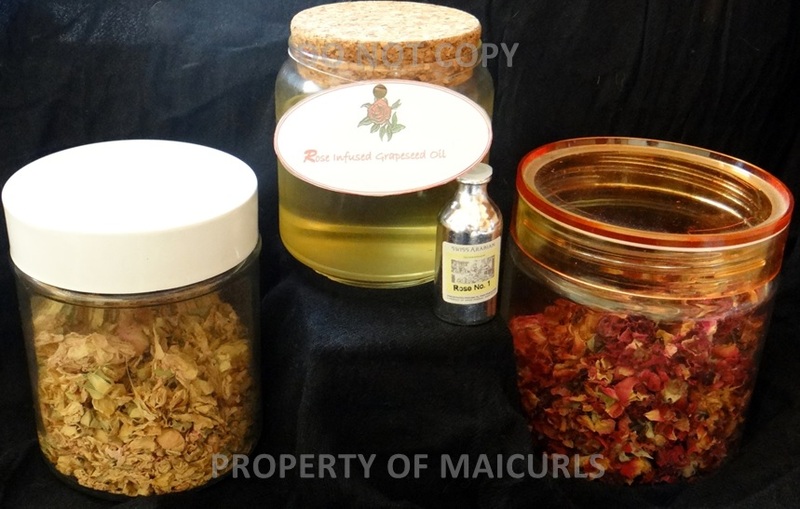 So, why would you want to use Rose Infused Oil for your hair and/or skin? Depending on the carrier oil you choose, you also get the additional benefit of that along with the properties of roses. On my blog I have a list of different carrier oil benefits for the hair and skin. Grapeseed oil is easily absorbed into the hair and scalp without weighing down the hair or clogging up pores due to the fact that it is an extremely light oil. Those with fine hair (such as I) can use it without worrying about having greasy hair. It is known to help heal alopecia areata as well dry and itchy scalps (consult your dermatologist) and can help fight dandruff. It is great at sealing and retaining moisture. 2 Weeks later I sieve the petals. If you try this please let me know how it turns out. 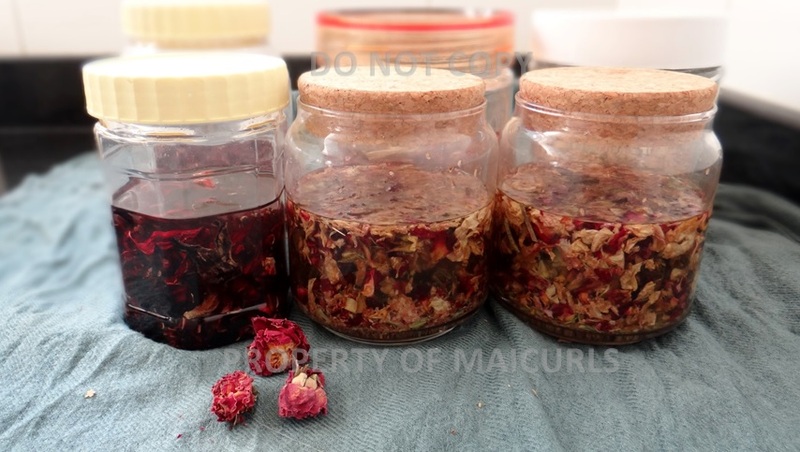 If you make your own Infused Rose Oil I would love to hear from you! 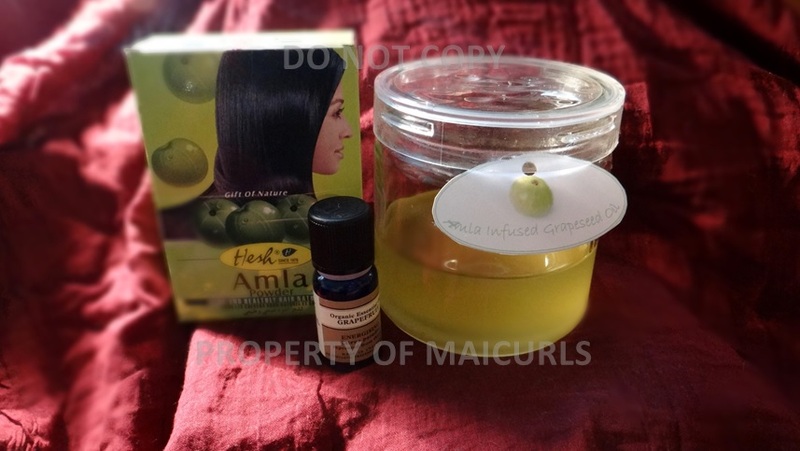 This entry was posted in DIY Infused Oil for hair, DIY Infused Oil for Skin, DIY Infused Oils, Infused Rose oil for hair, Infused Rose oil for skin and tagged DIY Infused oil for hair, DIY Infused Oil for Skin, DIY Rose Infused Grapeseed Oil, DIY Rose Infused Oil, DIY Rose Infused Oil for Hair, DIY Rose Infused Oil for Skin, Rose Infused Oil, Rose Oil on September 11, 2014 by Maicurls.